← MICHAEL McKINLEY. Deeply Denying the American Reality. Part 2: Australia’s avoidance means complicity. The brain cells are working overtime at the headquarters of network owners, grid operators, generators, and regulators. Australia’s electricity grid is about to make the leap from analogue to digital, and everyone is scrambling to keep up. Ever since the opening of the Tesla big battery next to the Hornsdale wind farm in South Australia last month, it is as though a new era has dawned for the management of Australia’s electricity supply. This is not just about flexibility, smoothing out renewables, or responding to peak demand and speed of response – it is also about grid security and grid stability. And it is causing a massive re-think. There is now no doubt that wind and solar will provide the cheapest form of electricity supply, in Australia, and most other countries, now and into the future. The first line of defense against this new reality for the defenders of incumbent interests is to ask what happens when the “wind don’t blow, and the sun don’t shine” – i.e. how to meet the peaks. The most obvious retort is that the existing fossil fuel system has a phenomenal amount of in-built redundancy to deal with exactly these peaks – think of all the “peaking” gas generators used for just a few hours a year – and to deal with major outages, such as the near 20 trips of major coal and gas generators recorded so far this summer. Studies by the likes of the CSIRO, the network owners, and the Finkel-commissioned review of battery storage, note that much less storage is needed than thought, if any at all, until the share of renewables heads towards 50 per cent. The falling cost of storage, and the flurry of projects in small and large-scale batteries, and the numerous pumped hydro schemes being considered in nearly all mainland states, should answer the storage question. The second line of defense for the fossil fuel industry is to point to the need for “synchronous” generation and system inertia. But just like the Maginot line deployed by then French in WWII, the incumbents are being outflanked by new technology and new ways of thinking. This is not as minor as you might think. You will find references to “inertia” and “synchronous” generation littered throughout the documents produced by rule makers defending the status quo and the incumbents whose future depends on it. It’s a fierce topic of debate – equivalent to the discussions that accompanied that shift from analogue to digital, from land lines to mobiles, from petrol cars to EVs. Just how much inertia is really needed? Not as much as you think, say some. A new study from Ireland, which like South Australia vies for global leadership in the amount of variable renewable energy supplies in its grid, shows that the conventional view of “inertia” may soon become redundant. The study called “Batteries: Beyond the spin” (a reference to spinning turbines that traditionally provide that inertia), hails the dawn of a new era of digital inertia. Principally, it says that 3,000MW of gas generators – the main providers of conventional inertia in Ireland – can be replaced by one-tenth of the capacity in batteries. It is time to go digital, it says, and change the rules accordingly. Such reports are causing experts to have a rethink about grid security, and to recognise that while we may need “synchronous” generation to provide “real” inertia, possibly the only reason we need “real” inertia is to support the synchronous generation. It is a nexus that begs to be broken, and because inverter-based technologies like wind and solar and battery storage operate in different ways – as different as digital to analogue – it’s got a lot of people thinking. (Of course, in Australia, there will always likely be some spinning turbines, even if only from pumped hydro plants or even spinning thermal. But that’s not much comfort to coal and gas generators trying to figure out their future). The study, by consultancy Everoze and the Queen’s University Belfast, with contributions from battery storage company AES and UK’s National Grid, promotes exactly this idea of “digital inertia”, and the lessons are as applicable to Australia, another island grid, as they are for Ireland. The study finds that battery storage can arrest the fall in frequency and the rate of change. In short, even though they do not provide spinning mass, what the study calls a “digital inertia” response provides the same benefits – or greater – as inertia. The study is well worth reading. It’s technical, but important, and provides a fascinating insight into how technology can change the game, and why regulators need to think differently so they can change the rules accordingly. “It’s time to stop framing ancillary services around the incumbent technology, and create a genuinely level playing field,” the report says. 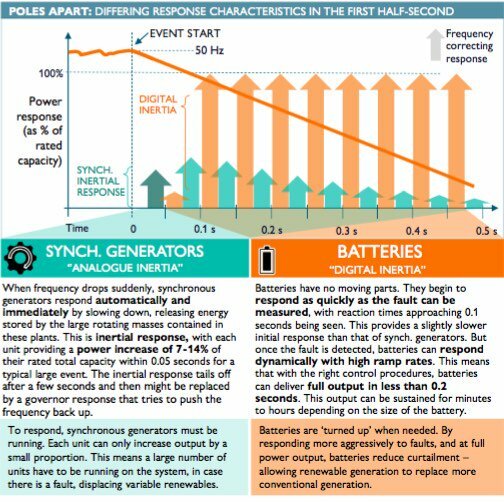 In a study on recent faults in the Irish grid, it found that 360MW of batteries could have provided the same amount of power, after 0.1 seconds, as the inertial response of 3000MW of synchronous generators. “Whilst the system operators are right to explore a combination of options for managing RoCoF (rate of change of frequency), the QUB study demonstrates how batteries can fully replace the power and energy delivered by existing inertial response,” it says. The experience in Australia with the Tesla big battery is already proving similar. What the Tesla battery has demonstrated is that while it will never beat fossil fuel generators on their immediate inertial response, it is substantially quicker to do whatever is required next. While “ synthetic inertia” or “digital inertia” are not instantaneous, they are still very fast (and controllable), unlike synchronous units which are not controlled for about the first second of any event as they just contribute their inertia. Australian experts say the issue in Australia is that the response times with governors (on thermal power plants) have been allowed to get longer, an issue that is causing concern for the market operator. Digital technology is considered to be precise and fast. By unlocking the potential of digital inertia, the QUB study says it is possible to refine operational constraints, use existing gas plants more efficiently, and retire or mothball less efficient plants, and save significant costs. But it needs a new approach to rule-making, a problem that many in the industry are facing in Australia.